October 10, 2018. In the Belousov hall of GC RAS researcher of the laboratory of geophysical data I. O. Belov made a presentation at a scientific workshop about the Mutnovsky volcanological school in Kamchatka. 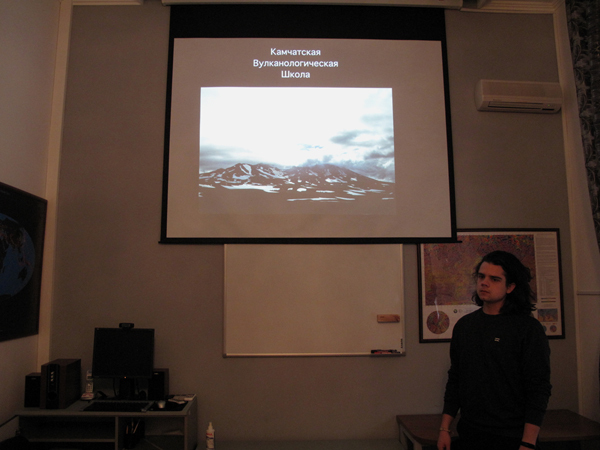 The young scientist spoke about the field research that was conducted as part of a school on the territory of the natural park “Volcanoes of Kamchatka”, as well as a series of lectures given by leading experts in the field of volcanology and petrology. I. Belov showed many photographs of Kamchatka landscapes.